The first items manufactured in space by a 3D printer were unboxed on April 6, 2015, at NASA’s Marshall Space Flight Center in Huntsville, Alabama. Engineers are about to start studying the first parts made by a 3D printer in space. Late last year, the 3D printer aboard the International Space Station cranked out 21 items, as part of a project designed to validate 3D-printing technology in microgravity conditions. 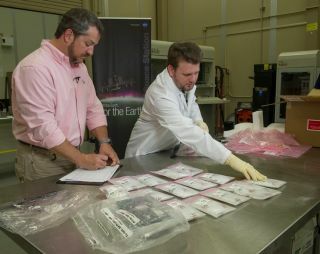 The parts came back down to Earth in February aboard SpaceX's robotic Dragon cargo capsule, and then were delivered to NASA's Marshall Space Flight Center in Alabama. On Monday (April 6), Marshall engineers opened up the boxes and took their first looks at the space-printed parts. "Before the printer was launched to the space station, it made an identical set of parts," NASA officials wrote in an update on Tuesday (April 7). "Now, materials engineers will put both the space samples and ground control samples literally under a microscope and through a series of tests. Project engineers will perform durability, strength and structural tests on both sets of printed items and even put them under an electron microscope to scan for differences in the objects." 3D printers build objects layer by layer out of plastic, polymers and other raw materials, in a process also known as additive manufacturing. NASA has high hopes for this technology, which agency officials say could reduce the costs of space missions and help humanity extend its footprint out into the solar system. Spacecraft and off-Earth colonies equipped with 3D printers would be much more self-sufficient, reducing the need for resupply from Earth, the thinking goes. NASA’s 3D printer on the International Space Station made a wrench, here seen after its return to the agency's Marshall Space Flight Center in Huntsville, Alabama. The space station's 3D printer was built for NASA by California-based startup Made In Space, as part of a collaborative project called the 3D Printing In Zero-G Technology Demonstration. The machine launched to the space station aboard Dragon in September 2014, and was installed in the station's Microgravity Science Glovebox by NASA astronaut Barry "Butch" Wilmore on Nov. 17. NASA expects to use the device again later this year, agency officials said. Made In Space, meanwhile, aims to send a larger 3D printer known as the Additive Manufacturing Facility (AMF) up to the orbiting lab later this year. The company will retain ownership of the AMF, which will be commercially available to users on Earth, Made In Space representatives have said.